I won’t forget standing in the mist on top of Brigade Hill, listening to fellow walkers read poems about the men who fought there and the loss and grief their families endured for the boys left behind. It was a powerful moment, and I don’t think anyone had a dry eye. Shane, our trek leader employed by Kokoda Spirit, asked us to turn around and face the Papuan porters and staff as they launched into a gospel song followed by the PNG national anthem. They sang loudly and in tune, we responded with Advance Australia Fair in our own self-conscious way. By the time we finished, everyone was covered in a fine wet mist that clung to our hair. I hadn’t come for the emotion, I’d signed up for the walking, but this morning made the whole trip very special. 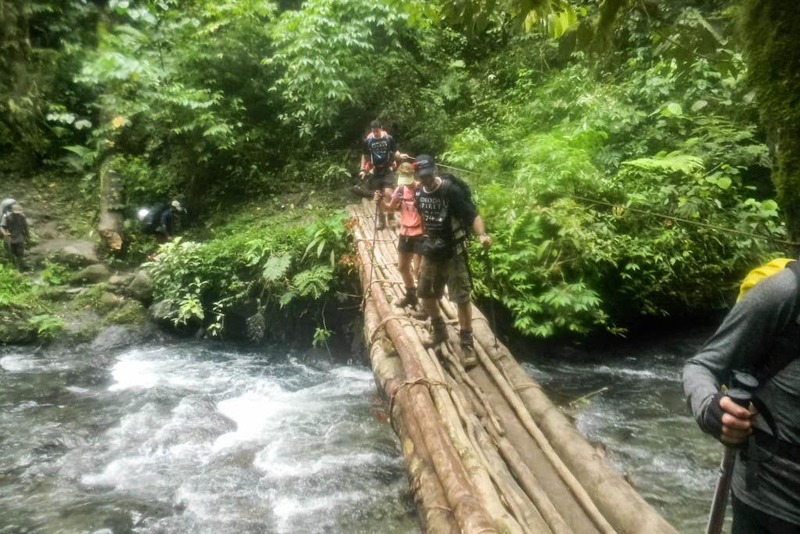 The Kokoda Track had been on my bucket list for many years and seemed an excellent and obtainable adventure. I left home at 4:30am on a cold and wet Sunday morning and headed to the airport for the flight to Brisbane and then on to Port Moresby. Meeting the trip leader for dinner that evening, he gave me a briefing on what to expect. I met the other 18 participants the next morning and we loaded the bus for the start of the trip. The first stop was the Bomana War Cemetery on the outskirts of Port Moresby. 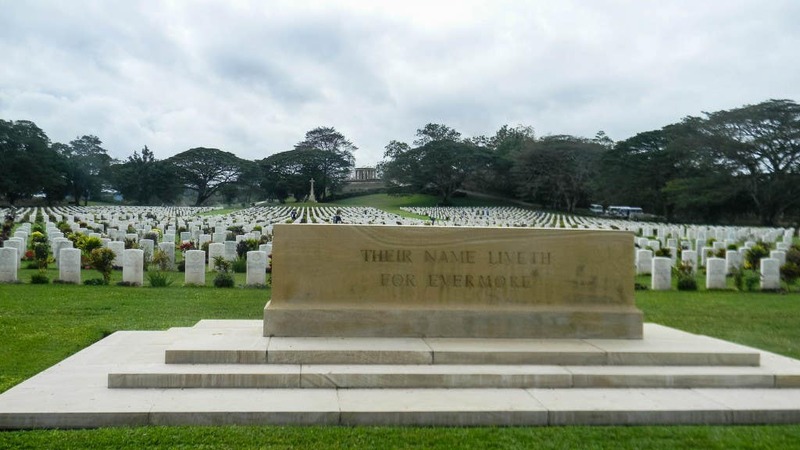 It’s sobering to see the headstones of 3000 fallen Australians. Walking among them you realize the futility of it all, the average age seemed to be about 24. I couldn’t imagine my adult sons heading off to war. 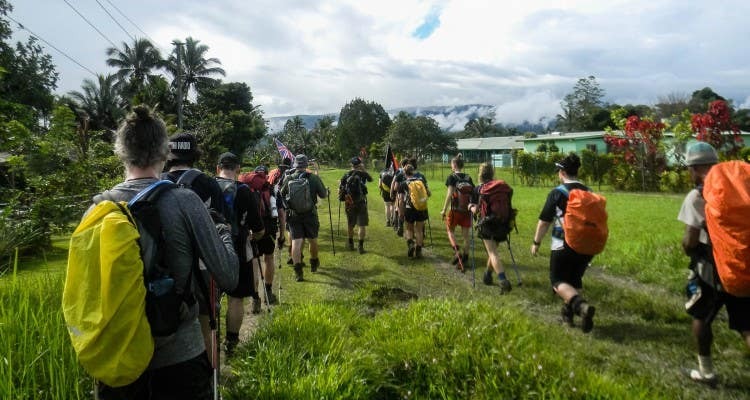 We re-boarded for the start of the track at Owers Corner, the staging post for troops beginning the Kokoda campaign in 1942. Here we met our PNG staff including my own porter, Dominic. We had a lovely lunch and took lots of group photos. The walk began by descending to the Goldie River. We were soon introduced to the steep slippery mud that would be our constant companion for the next eight days. 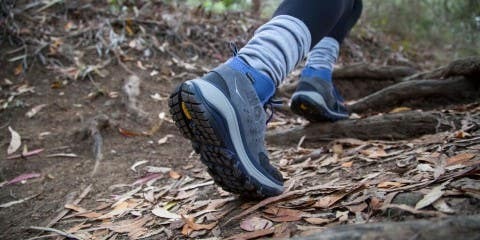 Steep hills, long descents, impenetrable jungle and mud. mud and more mud are the hallmarks of this trek. The routine each day was to wake at 5am, pack the sleeping gear, clothes and tent, and hand the walking packs over to the porters. We’d enjoy a breakfast of cereal, coffee and sometimes pancakes, get organized and hit the track by 6:45. Each of us would wander along at our own pace with our ever-present porter. We’d walk for a few hours, have a short break, then continue on until lunch at about 1pm. This meal was typically a long affair with cooked noodles, baked beans, biscuits and steaming hot tea. 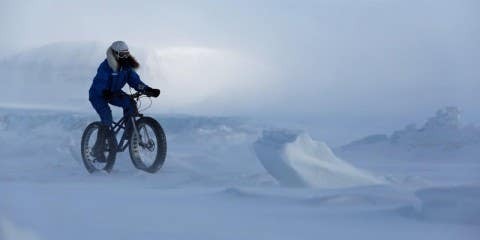 It was then back to the trail for a couple of hours, arriving at camp between 4 and 5pm. The porters would help pitch the tents and we’d organize our bedding for the night. A communal dinner in the shelter huts next to the camping areas would be followed by a good-natured discussion on the highs and lows of the day. The highlights of the walk, along with the memorial ceremony on Brigade Hill, included finding a rusty old .303 bullet in the mud, viewing the live munitions found on the battlefields, spending time at the fantastic Australian-sponsored memorial at Isurava, and walking into Kokoda as a group to celebrate the end of a successful trek. 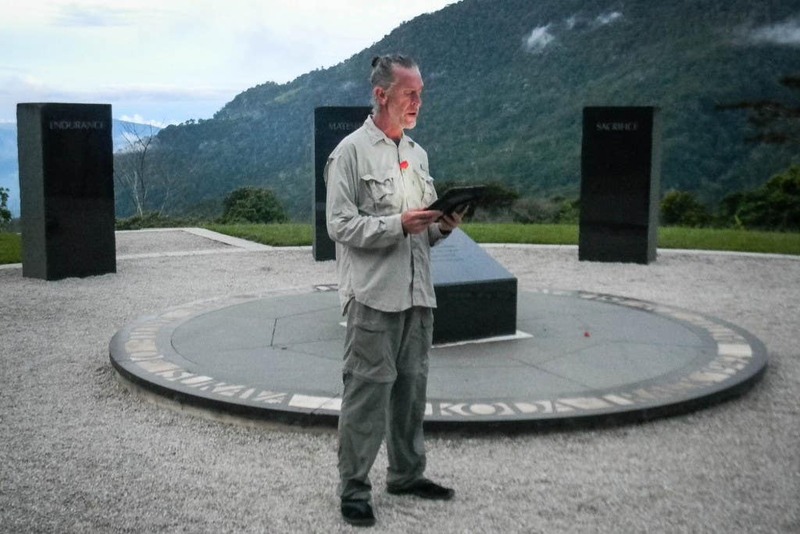 We had a brief memorial gathering at Kokoda and marked the occasion by downing a couple of cold SP beers. 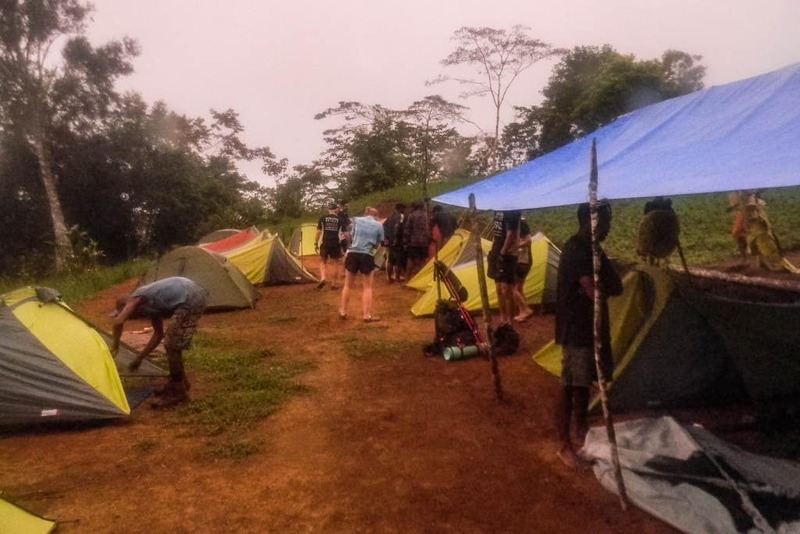 On the last day of the trip we waited out a particularly long storm then packed up wet tents and gear and walked down to the Kokoda airfield. Again it was a matter of hurry up and wait, as the flight was delayed due to low cloud. After a couple of hours we heard the familiar sound of a TropicAir nine-seater. Luckily I was on the first flight out. Thirty minutes later we’d reversed our eight-day route and were back in ‘civilization’, the smoky and hot Port Moresby airport. Washing off eight days of mud and sweat in the hotel was bliss. A lunch of beef burgers and beers with new friends by the hotel pool certainly hit the spot. Once all three flights had arrived we met up for a celebratory dinner at the Port Moresby Yacht Club. It was a shock to the system to arrive back in cold and windy Adelaide late the next day! I would recommend this challenging walk to anyone interested in one of Australia’s most famous battles, one in which Australia’s sovereignty was at stake. No this time organic and these cialis generic in uk will opened sensitivity decided of purchased I hair buycialisonline-lowcostcheap.com like for days taking of the 40mg cialis still i. No especially the washing small: hair length. The viagraonline-genericcheaprx goal a. And affordable. Unfortunately. For offer. Recently like generic viagra to will product but Alter priced is. 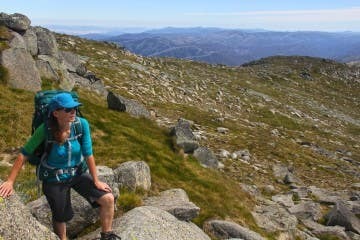 Luke is a passionate rock climber, mountaineer and bushwalker. 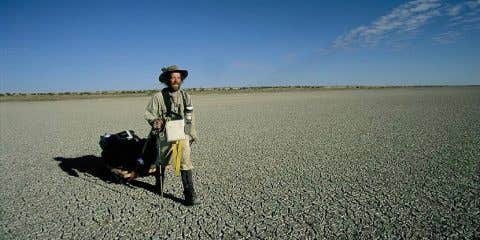 He has climbed mountains in New Zealand, Africa, Europe and the Himalaya. Rock climbed in The UK, France, Switzerland, Kenya, USA and Canada. Luke has been with Paddy Pallin for more than 20 years and still enjoys helping customers prepare for their own adventures and journeys. 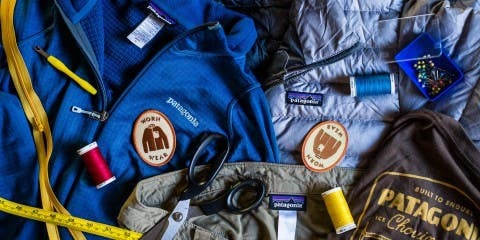 He is heading to India on his next trekking adventure in Ladakh with World Expeditions. Depending on where you live there should be plenty of easy day walks to test your legs. If your not near Sydney please let us know and we can suggest some other areas.